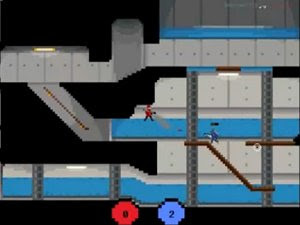 Originally conceived for the 2008 TIGSource.com 'Bootleg Demake' competition, Gang Garrison 2 is a free multiplayer 'demake' of Valve's Team Fortress 2 started by mrfredman and MedO with many developers later adding new features. With all 9 classes, many different TF2-inspired environments, and fast-paced, team-based, multiplayer gameplay represented, GG2 is the premier TF2 tribute/parody/alternative. Gang Garrison 2 presents the player with 9 unique classes to use in frenetic, cooperative multiplayer action in a stylish and unique 8-bit style. Battle with your friends or others you encounter online through a whole range of vibrant maps; TF2 maps reimagined in 2D as well as a multitude of maps with all sorts of different looks and settings, all of which have been dreamed up and constructed by members of our community. We've made a huge effort to provide simple, bugfree custom map support, so that anyone with a paint application can put together a map and test it themselves with our Garrison Builder utility. We also gladly encourage Gang Garrison modifications; many successful mods have been incorporated into the game as new features. While this game has come a long way, it is still a work in progress and many impressive new features are being planned such as new gametypes and alternate weapons. Because this game continues to grow only because of the devotion and hard work of our community, we invite you to come and participate in the future of this game. We are always looking for talented people to join the forum, contribute art, content, ideas, and modifications, and maybe even help us behind the scenes on new official versions. We hope you'll stop by and have a look at our game; it is the imagination and spirit of our players that makes it so fun.